Taj Mahal, the masterpiece of Mughal Architecture, is actually a blend of Persian, Ottoman Turkish, and Indian style of architecture. 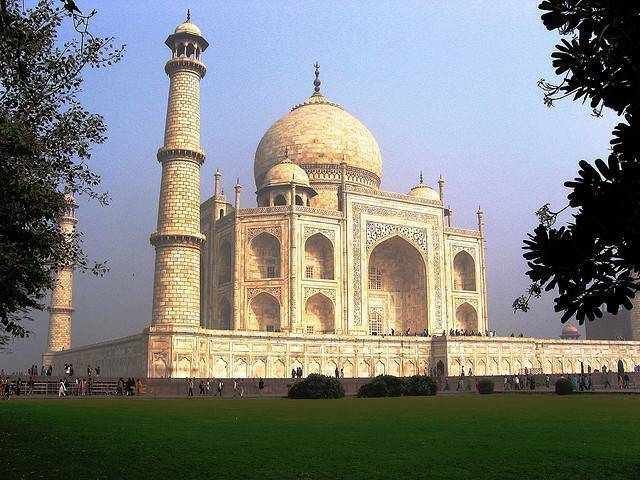 This finest monument was a tomb built by Shah Jahan for his lovable wife Mumtaz after she died. Nearly thousands of artisans and craftsmen worked from 1632 till 1653 to complete Taj Mahal. The center of attraction, the tomb is built on the square plinth. Its door are arch shaped topped with large dome. The finial over the dome was actually made of gold which was later replaced by bronze. On each corner on the square plinth there are minarets, with the height of 40 m. The Jali surrounding the cenotaphs inside the main building has intricate craftsmanship. The lush green garden alongside the pathway to Tajmahal entices the tourists a lot. Marble stone benches allow the tourists to sit back and admire the white marble wonder of Mughal Empire. The turreted elegance of this royal tomb makes it own statement, standing as it does among coiffured gardens and over the banks of the river Yamuna. Tickets cost 750 rupees for foreigners and 20 rupees for Indian nationals. Visit Taj Mahal early in the mornings to avoid long queues and crowd that gathers after 11 am. There are separate queues for Foreign tourists and Domestic tourists at Taj Mahal and signs will direct you accordingly. Tickets for any of India’s World Heritage Sites are available at ticket counters of every World Heritage Site in India. For night viewing of the Taj Mahal only 400 visitors are allowed per night and entry is from Eastern gate via Shilpgram. Remains closed on Fridays. Other days, opening hours: Sunrise to Sunset. Tombs of the Emperor and Empress on display are not real ones. Real tombs are situated beneath them, and opened for public viewing very rarely.